23 May 2008, at 12:00a.m. By Pas Reform Hatchery Technologies. 'Sweating' of eggs is the result of condensed water sitting on the egg shell surface. This occurs when cold eggs are suddenly exposed to a higher environmental temperature. The warm air with a certain moisture content cools down rapidly directly around the colder eggs. Since cold air contains less water than warm air, relative humidity will increase until the air is saturated. And at that moment, condensation will take place on the cool egg surface. The term 'sweating' is, if taken literally, misleading, because the water on the shell does not in fact come from within the egg. The same physical process is seen when a bottle of water is removed from a refrigerator on a warm summer day. Sweating of eggs should be avoided because moisture on the shell surface weakens the egg's natural defence mechanisms, providing as it does an ideal environment for the growth of micro-organisms, and further facilitating their penetration through the shell pores. Once inside the pores, micro-organisms are protected from most routine egg sanitising operations, therefore presenting a potential risk for contamination. Bacteria and fungi which manage to pass through the shell membranes will multiply at a rapid rate when they are exposed to incubation temperature, because the defence mechanism in the albumen is no longer able to protect the growing embryo. This of course will lead to increased embryonic mortality, 'exploders' and infected day-old-chicks (increased first week mortality). Clearly moisture on egg shells should be prevented. 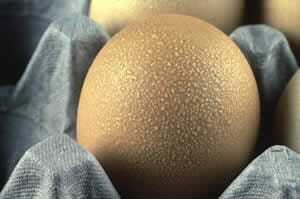 Egg sweating is prevented when the difference in temperature between the egg storage room and "the outside" (e.g. loading platform of the truck, egg traying room, setter) is small and the "outside" humidity is low. The table below can be used to predict whether sweating will occur if no additional measures are taken. For a wider range of temperatures and humidities, a so called 'Mollier' diagram or psychometric graph provides a useful tool. There is also a risk of eggs sweating if they are set too cold in setter that is already running to temperature, as is the case in multi-stage incubation practice. If the risk of sweating is high, pre-warm eggs gradually at least 6 hours prior to removing them from the egg storage room. This is achieved by switching off the chiller several hours before taking out the eggs. It is important to realize that not all eggs warm up at the same, uniform speed, especially with low air circulation and if stored on pulp trays and stacked closely together. Store at a higher temperature, combined with a shorter storage period, whenever possible. Connect the truck picking up the hatching eggs directly with the storage room to minimise any temperature differences from the outside environment. Ensure that the climate in the truck is the same as in the egg store. Maintain humidity below the levels indicated in the table. Prior to placement in the setter, place the filled setter trolleys at a room temperature of 25 °C with good air circulation for several hours. This pre-warming of the eggs before setting is particularly important when using multistage incubation. *** Assuming that the temperature of the eggs equals the temperature of the egg storage room. For further information or advice, please contact the Pas Reform Academy.